We are the nation's largest privately held wholesale distributor of plumbing, heating, and industrial supplies. We pride ourselves in providing the highest level of customer service possible. 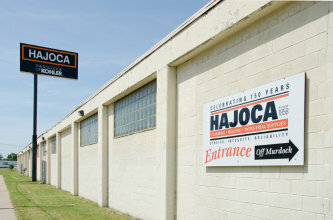 Our staff has the expertise needed to answer your questions, and with access to Hajoca's multiple stocking locations, along with close relationships with the premier vendors in the industry, we will provide you with what you need to meet your project goals, both on-time and on-budget. Our company has locations in 32 states, representing the most superior products in the industry. And with over 12,000 product lines at our Hajoca Wichita location alone, as well as pipe fabrication and repair services, we offer the broadest range of plumbing, heating, and industrial products and services in the Wichita area. Our goal is to make your selection process not only enjoyable and relaxing, but also effortless. Our expert showroom staff is dedicated to answering all of your questions. Whether you’re in the market of building a new home or upgrading or remodeling your existing home, our exclusive Kohler showroom is the perfect place to go for all of your decorative plumbing needs. Our variety of Kohler and other top line decorative plumbing goods will allow you many choices in decorating your space.